Gil & I visited the Andree Clark Bird Refuge back in January of 2001 when we stayed over in Santa Barbara for a few days of R&R and sightseeing. The refuge consists of a 42-acre saltwater marsh and a 29-acre freshwater lake which drains into the Pacific ocean at East Beach. Located in a suburban setting (i.e., an area of urban-wildlife interface) off of East Cabrillo Blvd. just south of the 101 freeway, it is replete with scenic views, lush vegetation, bike paths, trail & walkways. Really family friendly. Historically, the coastal saltwater marsh/lagoon was fed by Sycamore Creek, but construction of a railroad in the 1880's cut off the creek's fresh water flows to the area. The marsh dried out at times during the summer and was used as a horse race track. 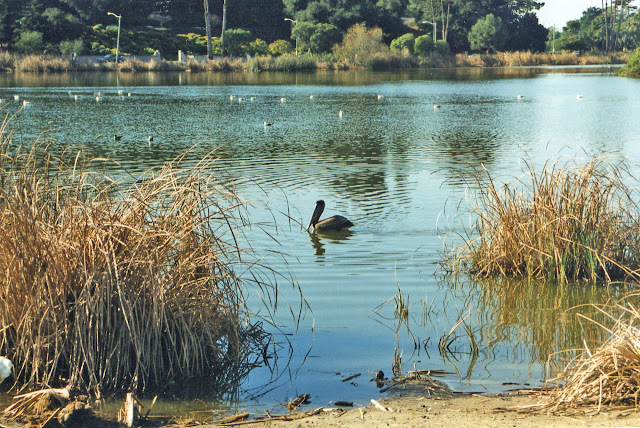 In the late 1920's, the City of Santa Barbara restored the area in order to create a permanent bird refuge, and with a contribution of $50,000 in 1928 from Ms. Huguette Clark of the Clark Estate across the way, a new artificial freshwater lake was excavated. The refuge's name comes from Ms. Clark's stipulation that the facility be named after her deceased sister. After some leisurely birding, we trekked over to the nearby Stella Mare's restaurant, which overlooks the refuge, for a brunch of eggs benedict. A casual place with great food, great views, and charming French country ambience http://www.stellamares.com/ . 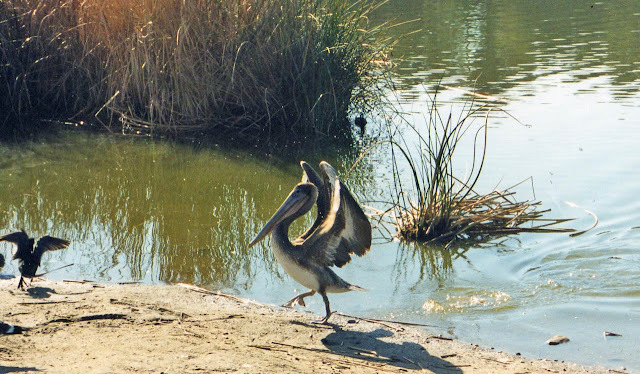 1/14/01 Brown Pelican (Pelecanus occidentalis). 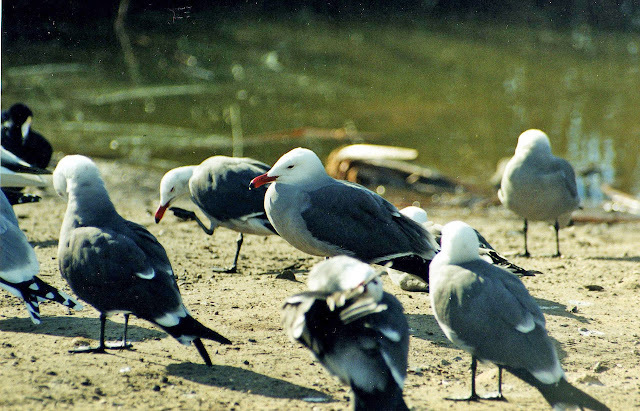 1/14/01 Heermann's Gulls (Larus heermannii). 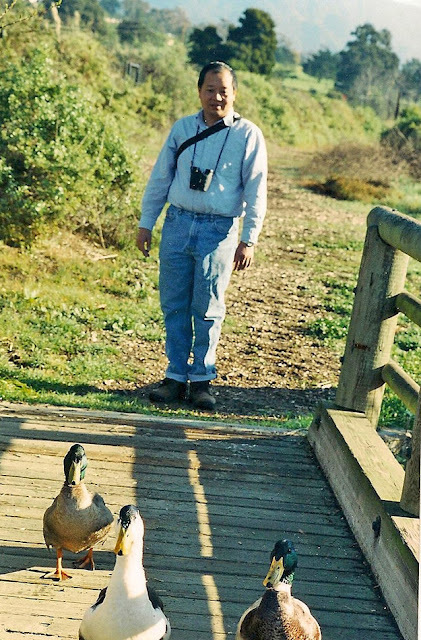 1/14/01 Gil, the erstwhile hunter, staring hungrily at the Mallards. Now that's one dangerous birder! Location: Eastern edge of Santa Barbara. The refuge is bounded by E. Cabrillo Blvd., Hwy. 101, and the Santa Barbara Zoo. Management: City of Santa Barbara. Size: 42 acres of salt marsh and 29 acres of freshwater lake, plus shoreline riparian habitat and beach lagoon where lake spills into ocean. Directions: Intersection of Hwy. 101 and E. Cabrillo Blvd. Contact Info: Refuge location: 1400 E. Cabrillo Blvd., Santa Barbara, CA 93108. Tel (805)963-0611. Amenities: Educational and interpretive programs, park & picnic areas. Signs identify native and migratory birds. Birds: 221 bird species recorded, including gulls, American coots, ruddy ducks, black-crowned night herons, mallard ducks. What we saw: Brown pelicans, American coots, Heermann's gulls, Black-chinned hummingbirds, spotted sandpiper, house finches.